We have selected three main strands: Love Brewed in the African Pot, with a ‘dine-and-view’ evening that will consist of a pop-up restaurant in which festival participants will watch prize-winning Ethiopian film Price of Love (2014, Ethiopia, Hermon Hailay) while enjoying Ethiopian food. This event will be organised in partnership with Menelik Education. Mukii), which explores the effects of Eurocentric beauty ideals, as disseminated by mainstream media. The other title in this strand will be The Great Kilapy (2012, Angola-Portugal, Zézé Gamboa). This rarely shown Lusophone film does not just revolve around love, but also around music and resistance. The evening will be followed by live music and a mini African fashion-show hosted by Congolese model Lisette Mibo’s charity Passion for Motherland, at the bar in Clare College. Finally, as part of the third strand Romantic views, showing different cultural interpretations of love across Africa, CAFF will be opening with South African fiction film Love the One you Love (2014, South Africa, Jenna Cato Bass), and the classic Egyptian film Cairo Station (1958, Youssef Chahine). CAFF will bring an extraordinary title to the Festival: Sudanese documentary Beats of the Antonov (2014, Sudan-South Africa, Hajooj Kuka). Awarded best documentary at the Durban International Film Festival 2015 and the African Film Festival of Cordoba-FCAT 2015, and the people’s choice documentary award at the Toronto International Film Festival, this film is about how people of the Blue Nile and Nuba Mountains in Sudan resist the situation created by the civil war through music. Other than the Lusophone title in commemoration of the 40th anniversary of independence, with the multi-layered resistance featuring The Great Kilapy, CAFF will be hosting a political screening of Algerian historical fiction film The Man from Oran, about the first euphoric years following the Independence of Algeria. This film will be followed by a Q&A with Lyes Salem, filmmaker and main character of the film, in conversation with Dr Jean Khalfa, from Trinity College (University of Cambridge). CAFF 2015 seeks to highlight the work of acclaimed African filmmakers who have been a source of inspiration in cinema production in the continent. One such filmmaker is Ousmane Sembène (1923-2007), from Senegal. 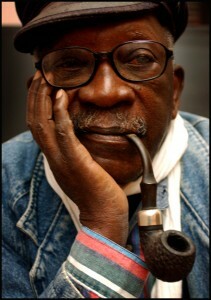 His biographer and friend Samba Gadjigo has recently made a biographical documentary, Sembène! (2015, USA-Senegal, Samba Gadjigo & Jason Silverman), which we are delighted to be able to screen. Since in this documentary Sembène’s fiction film Black Girl (1966) plays a key role, and since it is the 50th anniversary since it was made, we will also be screening this film, which many consider the first fiction feature film to be made by a sub-Saharan African. CAFF has always been committed to highlighting the work and talent of African women directors. This year we are excited to be offering a screening programme called ‘Experiments with love: young South African women filmmakers’ with films by Nobunye Levin, Nikki Comninos, and Jyoti Mistry, and with introductions by Lindiwe Dovey and reflections from Sara Blecher. These films complement others in the CAFF 2015 programme, such as Love the One You Love (Jenna Cato Bass) and Ayanda (Sara Blecher). In the past few years, South Africa has witnessed a dynamic new film movement, led by young women of all races, who are experimenting with the film medium to seek new ways of figuring South Africa’s past and present. What further binds these films is their attachment to questions of intimacy, interiors, and love: familial love, fraternal love, romantic love. CAFF 2015 will also feature a book launch, family day, live music and a mini-fashion show.